The home team is responsible for preparing and presenting the green referee report card to the center referee prior to a match. The top section of the card should be filled out before the match and each team should attach or print their game day roster on the card. For players, only their first and last name plus their jersey number should be included. Only a name is required for coaches or managers. 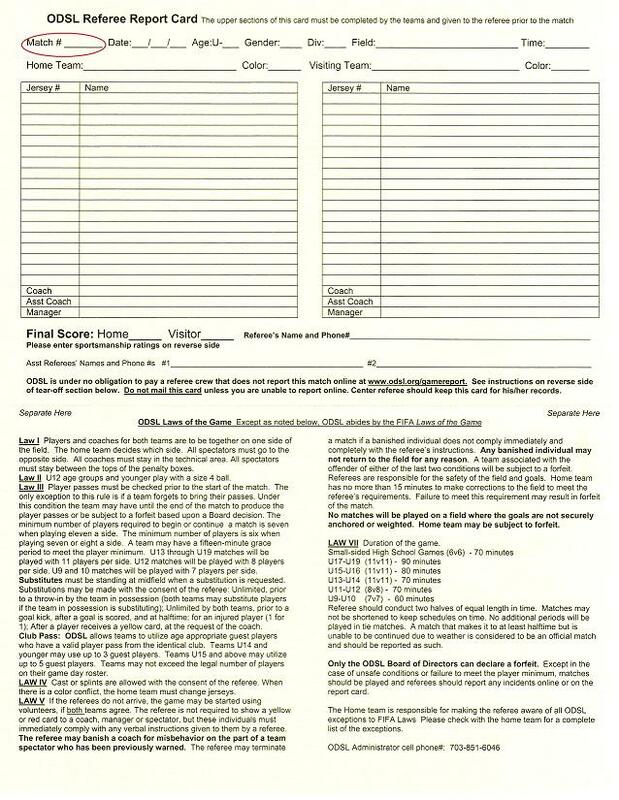 Instructions for printing team roster labels are in an article in the center column of the ODSL homepage and the league has provided each teams with a supply of labels in their team packet. It is very important that the official match number be placed in the appropriate place in the upper left corner of the green card. The match number can be found on the schedule in the column to the left of the date, as shown in the screen shot below. The entire report card must be given to the Center referee. DO NOT separate the lower section of the card at the perforation prior to giving it to the referee as this section provides important instructions for the referee. 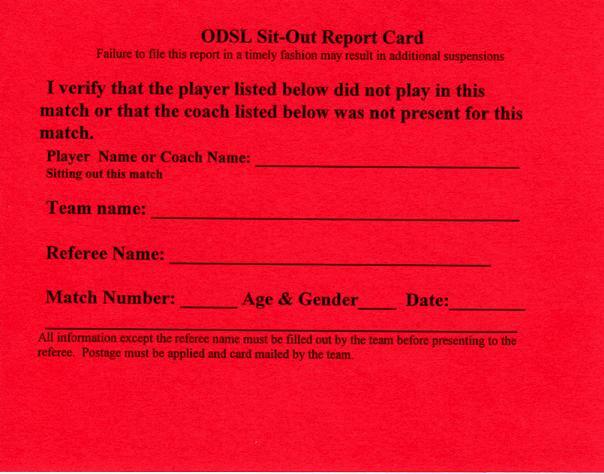 If one of the team’s players, coaches, or managers is shown a red card or ejected from a match then that individual must sit-out the next match and the team must mail a red Sit-out Report Card immediately following their next match. This card is verification to the League that the player did not play in the next match or that the coach or manager was not present at the next match. The card should be given to the referee of the subsequent match and he/she should sign it verifying that the individual did not play or was not present at the match. The team must then apply postage to the card and mail it to the administrator. Failure to do this within a reasonable timeframe may result in additional sit-outs for the individual. The ODSL would like to hear from their teams about referees who have good knowledge of the rules of the game and exemplary game management skills. By providing the league with this information we can incentivize these individuals to referee more of our matches. Please take a moment to utilize one of the cards provided for this purpose. Do not use this as a mechanism to complain about referees. If you mail this card, no matter what it says about the referee, they will receive consideration for a bonus.